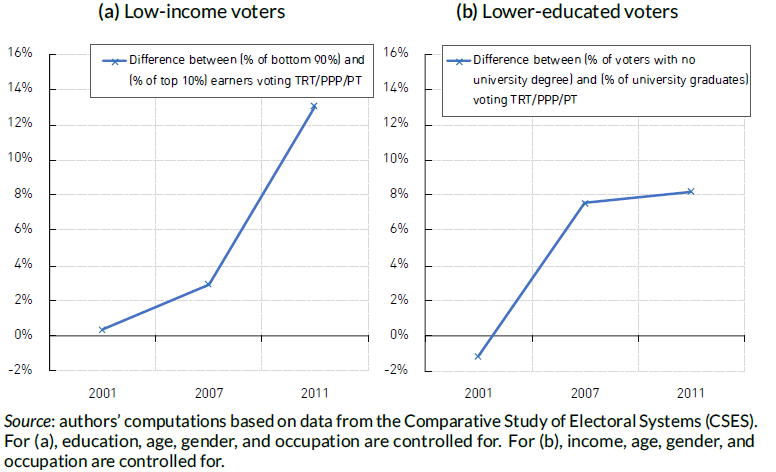 In this new issue brief, Thanasak Jenmana and Amory Gethin analyse the link between inequality, political instability and class cleavages in Thailand in the context of the general election planned for March 24. They argue that a main source of political instability is brought by Thailand’s extreme levels of income, wealth and regional inequalities, as well as by the rising politicisation of class conflicts around redistributive issues which followed the Asian Financial Crisis. New historical series on inequality in Thailand indeed point to very high levels of income concentration. In 2016, top 10% earners received more than half of the national income, which is higher than what can be observed in most world regions. The social policies implemented by successive democratic governments since the 2000s have been successful at promoting a fairer distribution of labour earnings. Inequalities remain high, however, due to the strong concentration of wealth and capital incomes, which are not addressed by existing fiscal policies. The post-1997 party politics successfully put an end to a long period of rising income disparities. Most importantly, they have been associated with the emergence of class cleavages visible in voting behaviours and party identification. These are conflicts opposing the established middle class and elites, who lost their relative economic and political power, to the poor and the emerging middle class who have benefited from a new and fairer economic era and put strong values on general elections.